Heirs to the Blood reprint bundles are now available! 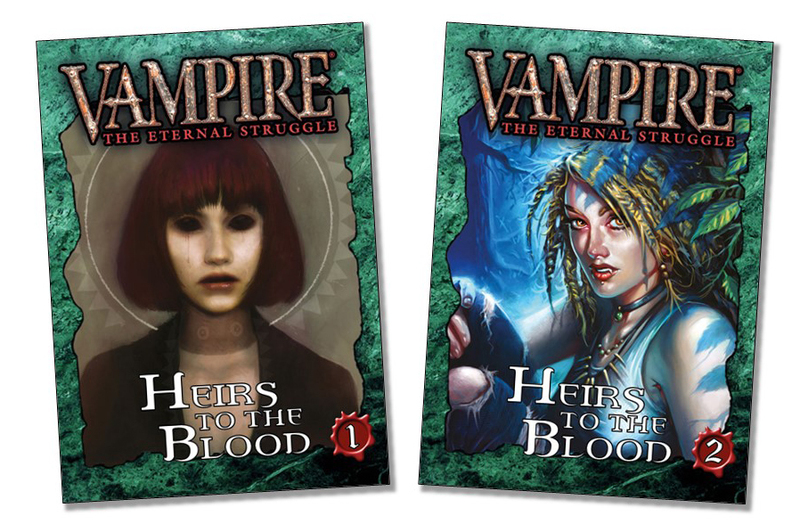 Two new products from Black Chantry Productions are now available for purchase at DriveThruCards: Heirs to the Blood reprint bundles 1 and 2. The eternal struggle feels as eternal as ever before – can you sense the warm winds of conflict and hatred in the air? Strange things are happening. Old daft soft targets are awakening after years in torpor, and trembling new bloods are being embraced every day. Last night I even saw a confused Ventrue recruiting the devious Walks-With-Might who pretended to be homeless sad-eyed puppy, of course immediatelly regretting it and being ousted by a triple-bounced Daring the Dawned Slaughtering the Herd-bleed. Ah, how I love this game! Leading into Origins and the North American Championship was the Week of Nightmares, the annual series of tournaments every day of the week prior to Origins. With seven tournaments over four days, it's a gruelling affair, but over twenty die-hard players battled through it. Many thanks to Jay Kristoff for organizing it and thanks as always to Fabian's, the local bar that graciously hosts us every year! 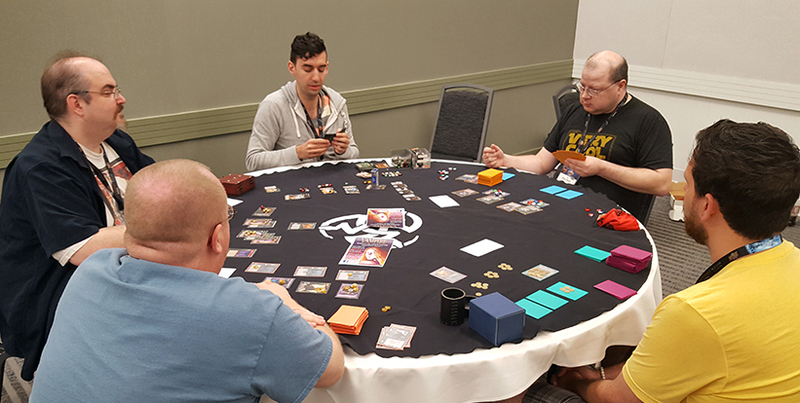 Friday of Origins brought Day One of the North American Championship. The surge in attendance continued, with 44 players competing. Games were fast and furious, and amazingly every single game resulted in a game win. After three rounds, the finalists were returning NAC Champion Martin Weinmayer (AUS), Alexandre Bustros (CAN), Darby Keeney (USA), Robert Lesniewski (USA), and Bob Joseph (USA). Martin was playing a Group 1-2 version of the classic Edward-Vignes-style deck. Darby was playing (I think) Giovanni power bleed. Alexandre showed off some of the new Lost Kindred cards with a Chicago Circle Blood Brothers deck. Robert and Bob threw fastballs with Kiasyd bleed and Obf-Dem bleed, respectively. Darby was first to fall, having run out of Deflections in the face of Robert's bleeds. With about an hour left to go, the Alexandre's Blood Brothers took their lunge, only to have the Walk of Caine cancelled by a DI. Martin bled out Alexandre on his next turn. Robert and Bob then ran out of gas, with Martin getting 4 VP total for the win! With the field narrowed down to 25 players, NAC action returned on Saturday for Day Two. The free-wheeling ways of Day One were clearly over, as Day Two became a more tense and tight affair. After three rounds and many timeouts and table splits, only 6 players finished with at least one game win. The finalists were Bob Joseph (USA), Bill Troxel (USA/Mohegan), Mehdi Mazni (FRA), Hugh Angseesing (UK), and Adam Hulse (USA). 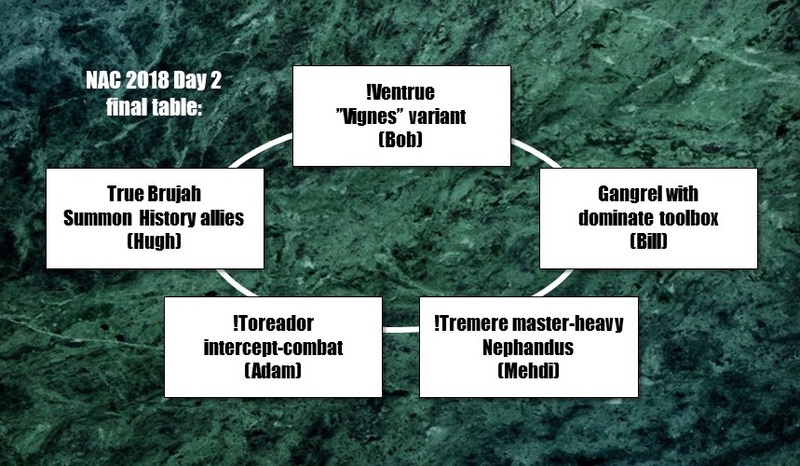 Bob played a Ventrue antitribu version of the Edward Vignes archetype. Bill played a Gangrel with Dominate toolbox. Mehdi brought a master-heavy Nephandus swarm. Hugh went with a Summon History deck. 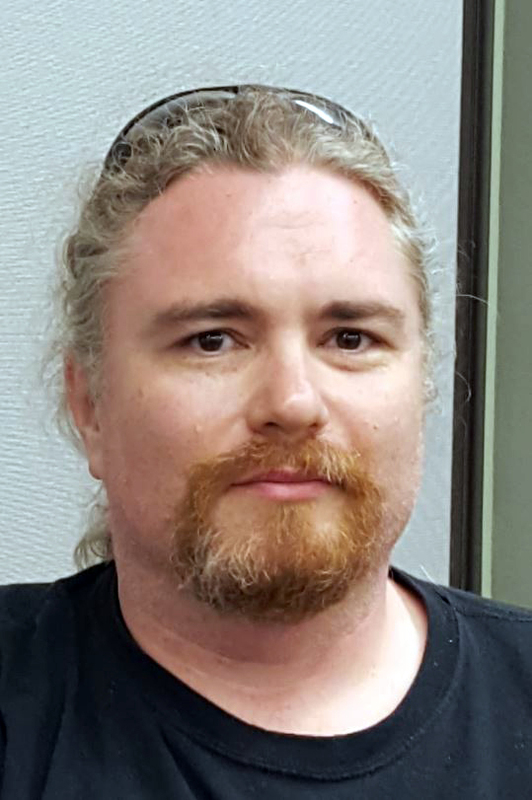 Adam Hulse used a Toreador antitribu intercept-combat deck. The final game was very cautious and deliberate, but the decks themselves contributed to a slow and static game. Hugh had difficulty putting pressure on Bob's Ventrue antitribu wall. Bob was stymied by Bill's Earth Melds and Deflections. Bill's Gangrel were met by Nephandi with the Unmasking and weenies with Deflections. The Nephandi were unable to make progress against Toreador antitribu with sticks and the Art of Pain. Adam in turn was shut down by the growing ally wall from Summon History. With time dwindling, Bill lunged at Mehdi but fell short. Bob then lunged at Bill and the blow landed, giving Bob the only oust of the final round. And with that, Bob Joseph is the 2018 North American Champion! And that's a wrap for Origins! 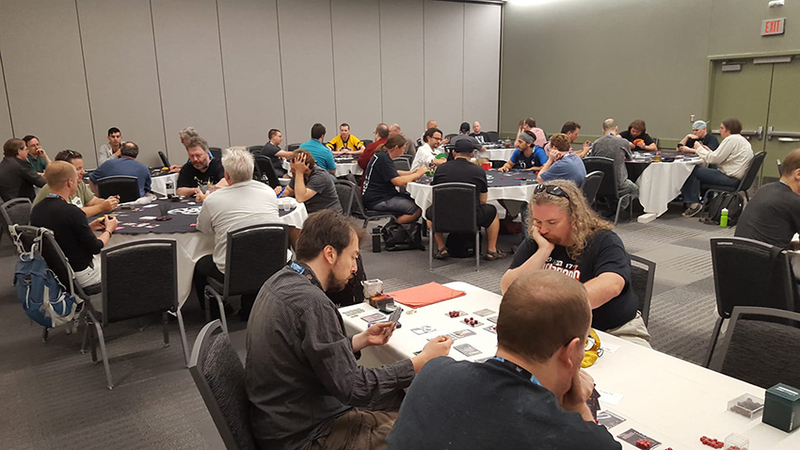 Many thanks to David and Robyn Tatu of Rose Tatu Productions, Stephen Buonocore of Stronghold Games, Rick Stock, and Black Chantry for their generous prize support! Thank you to every single one of you who attended and thanks, as well, for your friendship and great sportsmanship throughout the weekend! I look forward to more! Congratulations to the victory Bob! First things first; NAC is a two day tournament. How did it go day 1? What deck did you play that day? - I had two game wins with a !Malkavian Kindred Spirits deck and managed to draw only two or three Kindred Spirits the entire game in the final, which Martin Weinmayer won. 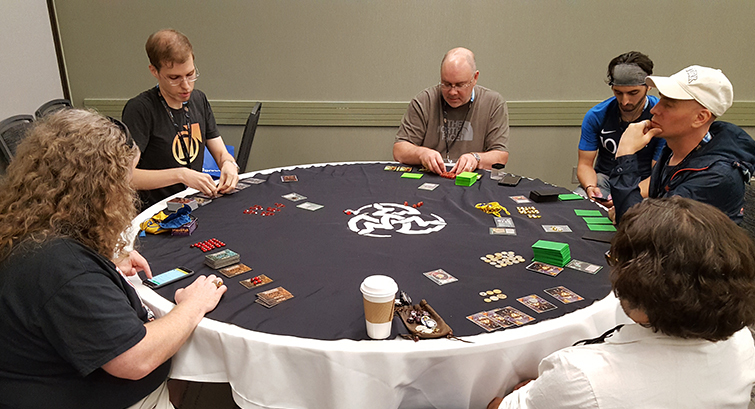 How did you choose deck for day 2? - I like to play something on day 2 that I know well. I've been playing this !Ventrue deck for a long time and know exactly how it works. It was built for my first Great Lakes Qualifier tournament many years ago with a philosophy of trying to cancel a few key votes, have the ability to block (Bowl of Convergence and KRCG) once in a while, bounce big bleeds, and lunge when necessary with Daring the Dawn, Anarch Troublemaker, and Pentex Subversion and lots of dominate cards. Any prey and predators you like or don´t like? - With prey who can bounce bleeds, I have to load up my hand and lunge and hope that they can't bounce all of them. With a predator who blocks, it's hard to use early Govern the Unaligned and Scouting Mission to bring out more vampires (for that inevitable lunge). A predator who is too fast also makes it hard to set up the perfect hand, but that's no different for this deck than any other. The deck is strong in that it can use the bleed cards for bringing out more guys with dominate early, and to oust your prey in the late game. Then came the day 2 tournament. How were the preliminary rounds for you? - Round one included two of the guys who I sat with in the final, Adam and Hugh. Adam's occasional blocking as my prey was frustrating. Hugh´s deck mostly focused on his predator. I forget what happened exactly, but I won. Round two I had Darby as my prey and drew all of the B-team but managed to oust him with dominate quickly. Bill – who I also played with in the final – was my next prey and was able to block or bounce until I was ousted by the !Ventrue deck behind me. I can't remember everything about round 3, but I won that game too. I think Jesper was my first prey. His prey was Norm playing some sort of trophy deck with Nosferatu, followed by Martin with big Gangrel, I think, and I forget who my predator was. Norm's Ancilla Empowerments made that game super short by removing tons of pool from the table. At one point Martin had to spend two actions to remove Red List from one of his minions due to my vote cancelling ability. I think Nathan might have been my predator in that game with Followers of Set who were using Spell of Life. Maybe. I remember a lot of laughing during this tournament. Strange things were happening, and the games were not nearly as stressful as they have been for me in the past. It was a thoroughly enjoyable weekend for me for the first time in many years, full of friends and beer. What were your thoughts when you sat down at the final table? - The talk of the day was Mehdi´s deck which was a very efficient Nephandus deck. I had not played against it, I knew I didn´t want to sit next to it, but as second seed I didn´t get to make that choice. I was faced with a choice between Bill => Adam => Hugh. Game one went well with me as Hugh's prey since he mostly focused backward, so that seemed like a good choice, and not sitting next to a deck with intercept also seemed like a good choice. It turned out that Bill did have a Sport Bike and a few other tricks available, but that was okay. Mehdi chose to sit as Bill's prey. How did the final play out? Any particular turning points you remember? - I knew that it was going to be a long game, and that a well-timed lunge and my seating in second place could get me the win with one VP. I played my game, using Governs and Scoutings to bring out a few more guys. Hugh did enough bleeding that I couldn´t get a fourth guy, but with Owain Evans and Blackhorse Tanner the situation was good. I abused Blackhorse Tanner on every turn possible to craft a perfect hand, spending Deflections on Hugh´s bleeds of one whenever I had them since I didn't think I would ever need them for Adam. My Direct Intervention ended up being used on Bill's Under Siege which proved to be key in the end. I had managed to fill my hand with seven bleed cards with about 25 minutes left and took my chance. Everything got bounced or blocked as Bonding was cancelled at least once. I managed to not lose any vampires in the process however, despite the Slow Withering having been played across the table. Bill tried his lunge and failed, and I think even lost one of his vampires. Mehdi was not able to get Adam, and Adam was not able to get Hugh. I shockingly – to me, not to others who I talked to after the game – got another turn, and had crafted an even better hand, with a Pentex Subversion for Bill´s untapped guy. It took all three bleeders to finish off Bill´s 7 pool. Mehdi was still not able to get Adam which was enough for me to win. Do you think you have a special “style” of playing? Do you prefer a certain type of deck? - I have something like 50 decks constructed at any one time, but haven't been able to play much in the last few years other than the Week of Nightmares and the Origins tournaments. I will play any style of deck – it's easier to learn how to play against a deck by playing that style of deck yourself, in my opinion. I have a few old favorites that I play often, including a Joaquin Murietta wall, a Mikael Birkholm Kpist/Target Vitals deck, an Una PRE/PRO vote/bleed deck and the !Ventrue that I played in the NAC this year. But my absolute favorite is a group 2-3 Temptation deck. We thank Bob for this chat. Congratulations again, and good luck in future tournaments! Spotlight-articles about new cards Gwendolyn Fleming and Hiram “Hide” DeVries were published early this months. 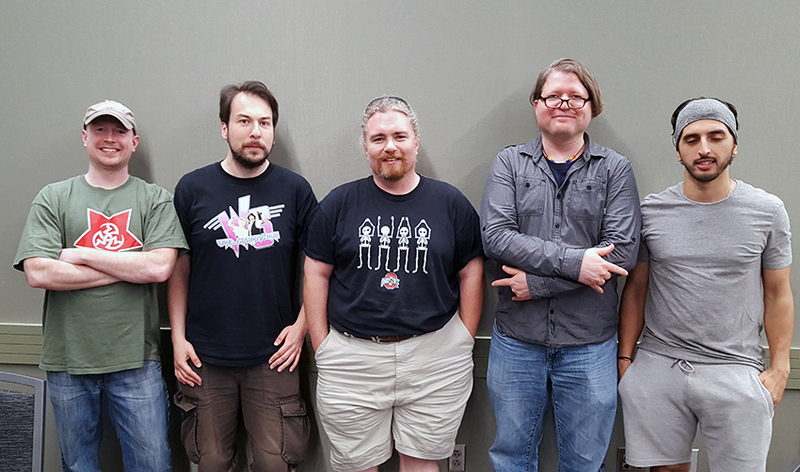 Black Chantry´s Hugh Angseesing and Ben Peal (also tournament organizer) attended the Week of Nightmares and NAC 2018 events at Origins Game Fair in Ohio, USA. Black Chantry are trying to secure both printing and distribution outside of USA. Print on demand via DriveThruCards.com will continue, but additional channels will be opened to get you new VTES products, and hopefully the game will be available in all kinds of stores within soon. Details about this will be communicated when deals are sealed. The whole crew are working hard on the next launch, which will be two reprint bundles of Heirs to the Blood. 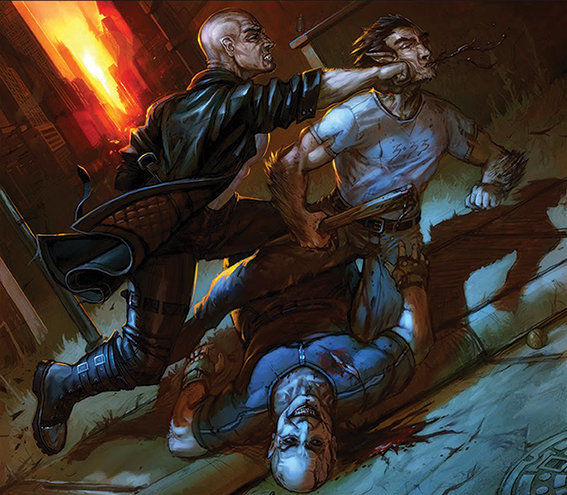 The top image in this newsletter is art from a card in one of those bundles; Thicker than Blood by Phil Wohr. Please contact Black Chantry by e-mail, Facebook or Twitter. We are proud to reveal that the discipline symbols from our beloved game are used in the upcoming 5th Edition of Vampire: The Masquerade! This is as far as we know, with the exception for the Bloodlines computer game, the first time these symbols have been used outside of VTES. 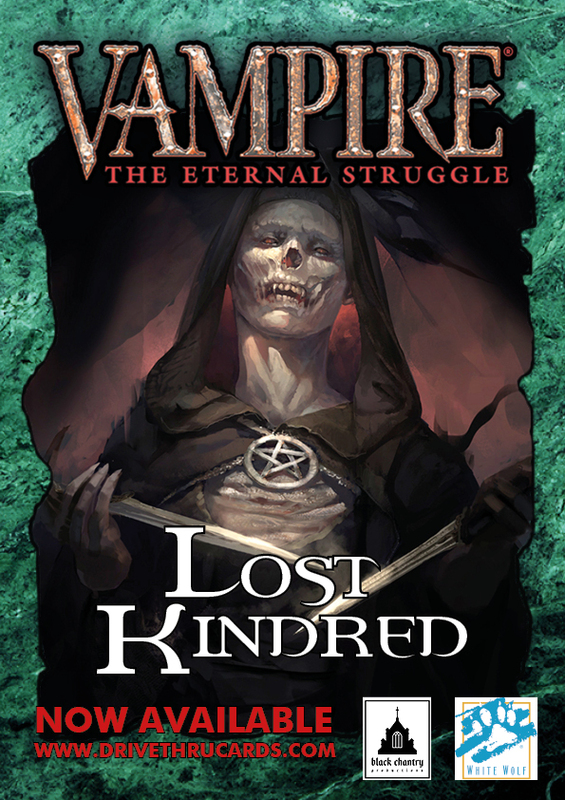 Log on to Worldofdarkness.com and download the "Preview of Vampire: The Masquerade 5th Edition" document to see for yourself. Celerity is not celerity without the flash! White Wolf does a presale of Vampire: The Masquerade 5th Edition on www.modiphius.net. Don’t miss it, should arrive in August! "If I am good, I could add years to my life. I'd rather add some life to my years." 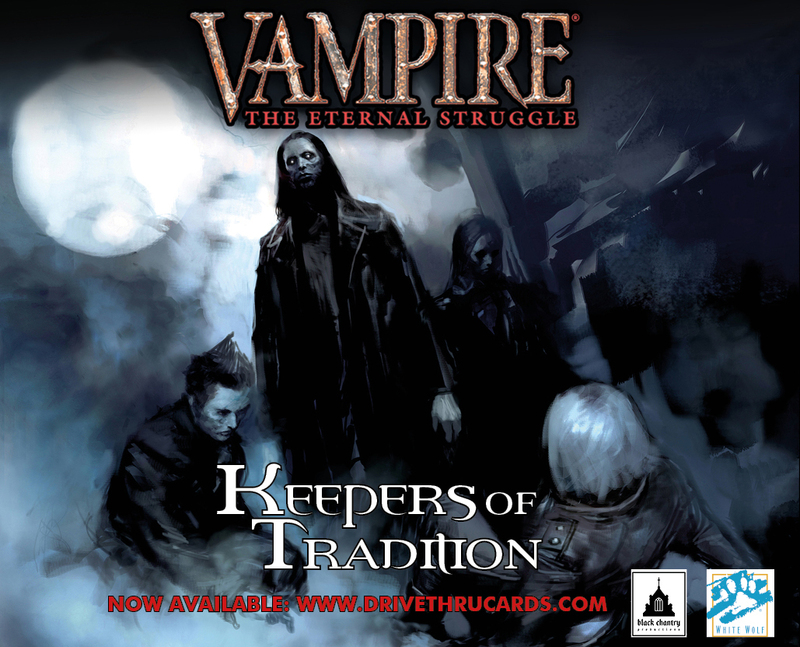 Three crypt cards were left out from the original printing of Keepers of Tradition back in 2008. Black Chantry Productions have chosen to include these cards in their reprint bundles. According to the 2003 Vampire: The Masquerade sourcebook “Succubus Club: Dead Man´s Party”, Hiram “Hide” DeVries is the current proprietor of the Succubus Club. It is no longer a permanent establishment found in Chicago, but instead a mobile nightclub, moving around between cities in North America. 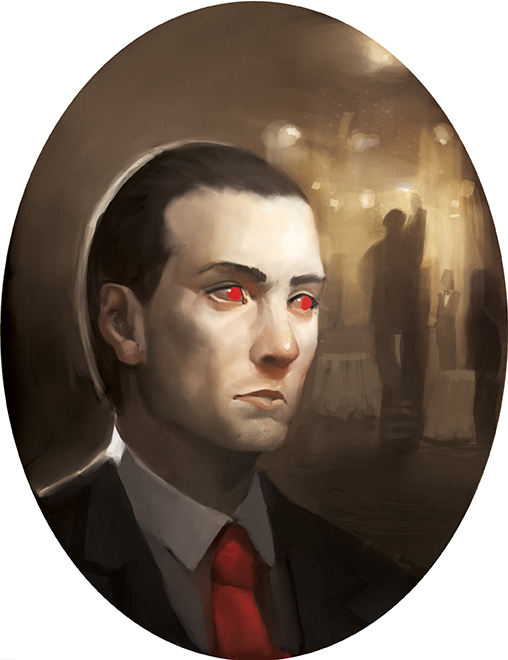 Camarilla: While Hiram is ready, actions to burn a location you control cost 1 additional blood. While not exactly a powerhouse, Hiram is a 3-capacity vampire with a corner-case ability that late game might deter others from attacking your locations. Sadly, his Succubus Club is one of the only four cards in the original 437 card Jyhad set that is banned from tournament play. Let´s see how long it takes before a deck with Hiram is entered into the Tournament Winning Deck Archive. The challenge is on! The artist Matias Tapia is an acclaimed illustrator and concept artist that has done work for Blizzard, Wizards of the Coast, Fantasy Flight and numerous others. Hiram “Hide” DeVries is found in The Keepers of Tradition reprint bundle 2 together with other Ventrue cards and also cards for Toreador, Tremere and Caitiff. For a complete list of all cards in the bundle, check out the product page at DriveThruCards.com.